An England Youth International, Entwistle joined Bury in August 1976 and played fifteen run-on appearances and sixteen games as a substitute and scored seven goals before he was transferred to Sunderland for £30,000 in November 1977. He made forty-three starts and two substitute appearances for the Rokerites and notched thirteen goals in the League, scored once in four starts and one game from the bench in the F.A. 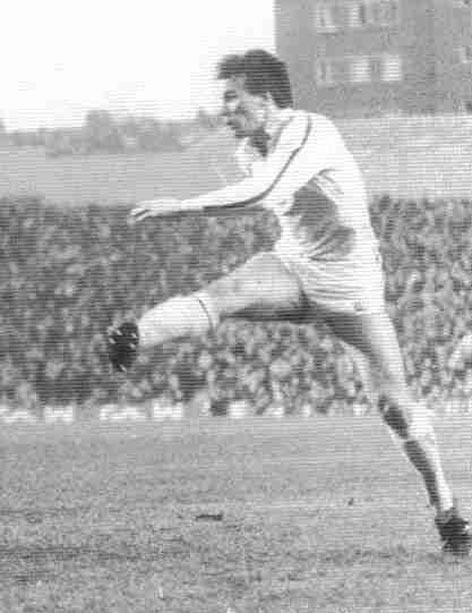 Cup, made two starts in the League Cup without scoring and scored twice in four starts in the Anglo Scottish Cup, until Jimmy Adamson signed him for Leeds in October 1979 for £80,000. Thirteen months later, in November 1980, he was released on a free transfer to Blackpool after he had only managed two goals in twelve appearances. For the sea-siders he managed six goals in twenty-seven League starts and five more from the bench. He then moved around the lower divisions with Crewe Alexandra, on loan in March 1982, no goals in eleven League starts, Wimbledon on a free transfer in July 1982, three goals in nine League appearances, five of which were as a substitute, Grays Athletic, Bury in August 1983, where he had his most prolific spell scoring thirty-two times in eighty League starts and three games from the bench. He carried on his tour of the clubs in the lower Leagues when he joined Carlisle United in July 1985 for £20,000, but failed to shine as they were relegated and he made just nine League appearances, one of which was from the bench, with two goals in his short stay. Bolton Wanderers were his next club in October 1985 after they paid £10,000 for his services, and he failed to score in five starts and three games from the bench. He went to Burnley on loan from August 1986 to October 1986, making his debut on 23rd August 1986 in a 1-1 draw at Torquay United. He scored twice in eight League appearances, including two from the bench, and made one start and one substitute appearance in the League Cup before playing his final game on 4th October 1986, in a 1-4 defeat by Preston North End at Turf Moor. Then it was on to Stockport County in October 1986, where he hit the net eight times in forty-nine League games, eleven as a substitute. He was back at Bury again in August 1988, for two substitute goalless appearances and then on to Wigan Athletic from October 1988 to March 1989, making his Latics League debut on 22nd October 1988 in a 1-2 reversal against Sheffield United at Bramall Lane and made twenty-four starts and five more appearances as a substitute, which yielded six goals. He next had a spell at Non-League Altrincham in July 1989 and, after a brief spell at Hartlepool United, where he played in his debut on 9th September 1989 in the 1-2 home defeat by Gillingham and his second and final game in a 0-6 rout at Stockport County on 15th September 1989, at the start of the 1989-90 season. He did not score in either of those two games and then joined Halifax Town in 1989 and later played with Curzon Ashton, Bacup Borough, Radcliffe Borough, Buxton and Droylsden. After retiring he went into the meat delivery business, he also did part-time work as a DJ at Weddings, birthday parties etc but let others do the spinning of the discs.